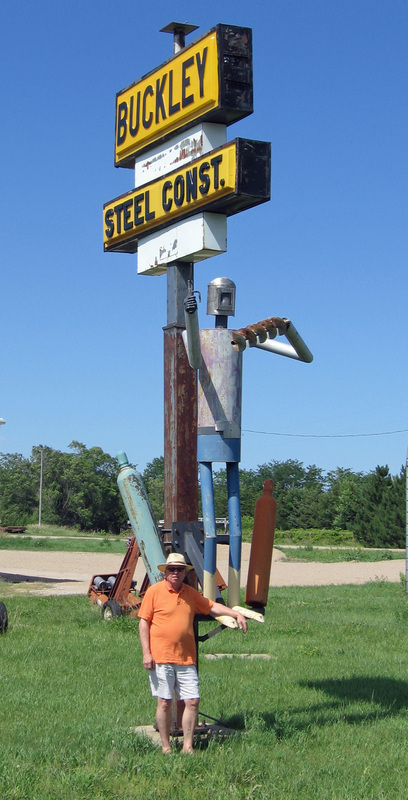 Big Steel Guy – The Home of My "Big Things"
Unplanned and kind of in the proverbial “middle of nowhere” we found this big steel guy probably created by some bored welders. I have not planned on visiting. We were just driving across Nebraska on US-20 from Souix City, Iowa to Valentine, Nebraska. If you have never driven here I would urge you to make the trip. You drive through the eastern part of the Sand Hills of Nebraska. The Sand Hills is a region of mixed-grass prairie on grass-stabilized sand dunes in north-central Nebraska, covering just over one quarter of the state. (Thanks Wikipedia for this description). Anyway we stayed the night in Valentine, NE. A very friendly town, lot’s of authentic cowboys and close to Smith Falls, the tallest waterfall in Nebraska located on a small stream tributary to the Niobrara River. The state park there is very nice and was under-used when we visited.